Our Odd Warrior deck list guide features the best Rastakhan deck list for Season 61 of Hearthstone (April 2019). Our Odd Warrior guide also contains Mulligan advice, card combos and strategy tips. Odd Warrior has been a part of the meta ever since Baku the Mooneater popped up with the release of last April's Witchwood expansion. When you have this minion in your deck, your hero power becomes doubled in strength, although you're limited to packing your deck with only odd-cost cards. Despite this limitation, the idea here is that you will be able to outlast pretty much anyone on the ladder thanks to that massive pool of defensive Armor. With the release of some key new cards with Rastakhan's Rumble, the deck archetype became even stronger. To help you get to grips with Odd Warrior, we've put together a comprehensive guide that explains the ins and outs of playing it. We've highlighted the best deck list in play right now, and provided strategy advice for all aspects of it. We've also got some tips for the Mulligan phase, and a look at all the most important card combos contained within it. We're holding onto the Odd Warrior deck list we were highlighting throughout March, as there's very little way of refinement for the archetype. Don't forget that Baku rotates out in a week or so from now, so don't hang about if you still want to play this one! Odd Warrior is a control-oriented deck that uses the upgraded Tank Up! Hero Power from Baku the Mooneater to build a huge pool of Armor that will help you out-live opponents. It also features so many defensive options that you’re able to comfortably remove all of the opponent's threats and eventually send them into Fatigue. With Rastakhan’s Rumble, the core of the deck remains relatively intact, while new additions in the form of a Dragon package round out the list with some useful tools Warrior has lost or was forced to give up to meet the Odd card only restriction. With that utility back in the deck, it can be a seriously competitive deck once again. Early game: You can spend a lot of your early turns using your Hero Power to steadily build up some Armor, along with an early Eternium Rover play. The damage from your opponent’s early minions should only dent it a little. Whatever the case, you’re in no massive rush here to play cards. Mid game: As you approach the mid game, you’ll want to start taking a more proactive approach at dealing with your opponent’s minions. You should have built up a fairly healthy Armor pool with Shield Block and Emberscale Drake that’ll make Shield Slam capable of taking out almost any target. That stack of Armor can also clear out a wide board thanks to Reckless Flurry, or you can also go for a classic Brawl if you’re feeling overwhelmed. Supercollider is another way to clear out your opponent’s minions if they’ve positioned them poorly. Late game: Entering the late game, you’ll want to continue removing threats as and when they pop up using Crowd Roaster and the execute effect on Smolderthorn Lancer. Your opponent shouldn’t have too much left at this stage, and that’s good because you’re just warming up. Dr. Boom, Mad Genius gives you so many options in the late game through a new Hero Power that cycles after each turn. Once you hit ten Mana, Omega Assembly becomes another way to generate huge value over your opponent and run them out of the match completely. 1. This deck is packed with removal so you can use it quite freely, but try to entice aggro decks to over-extend on the board so you can punish with a large clear. 2. Stonehill Defender and Zilliax are annoying taunt minions that will slow fast decks down to a crawl. 3. Dyn-o-matic works particularly well against aggro too, and the damage won’t affect any of your mechs. 4. Once you’ve starved them of resources you can start taking a more aggressive approach in the game and push for damage. 1. Even though you probably seem evenly matched, this deck packs so much value that you can likely outlast many other control decks. 2. With that in mind, feel free to take it especially slowly in the early game, just generating Armor rather than playing cards, simply because you have the Mana spare to do so. 3. Shield Slam is excellent at dealing with your opponent’s largest threats. 4. It’s also very good to combine your one damage effects with the execute effect on Smolderthorn Lancer to kill off your opponent’s largest minions. Get yourself off to a strong start by looking for these cards in your opening hand. 1. Eternium Rover: A solid early game minion that contests the opponent's early plays and also starts building up those Armor reserves. 2. Stonehill Defender: A strong taunt minion to slow aggro in the early game, while also generating you an extra card for later on. 3. Shield Slam: You'll be building up a lot of Armor in each game, and Shield Slam can be used to obliterate the most problematic minion on the board. 4. Shield Block: Some decent early game card draw that will also start to build up your Armor pool. - Shield Slam's strength is equal to that of your current Armor value at the time of casting. Shield Block can be used to boost your current Armor reserves, while your upgraded Hero Power is another obvious source of power. - Play Omega Assembly with ten Mana in the bank if at all possible. That way you'll get to keep all three Mechs that are drawn as part of the Discovery process. - Once cast, Reckless Flurry will dish out an amount of damage equal to your current Armor level to every minion on the board. Note that you lose your Armor in the process. - As Odd Warrior is unable to run execute you can instead include Smolderthorn Lancer to give you that hard removal option. You need to be holding a Dragon in hand, plus the targeted minion needs to be damaged for it to work, but there are multiple ways to meet these parameters in the deck. 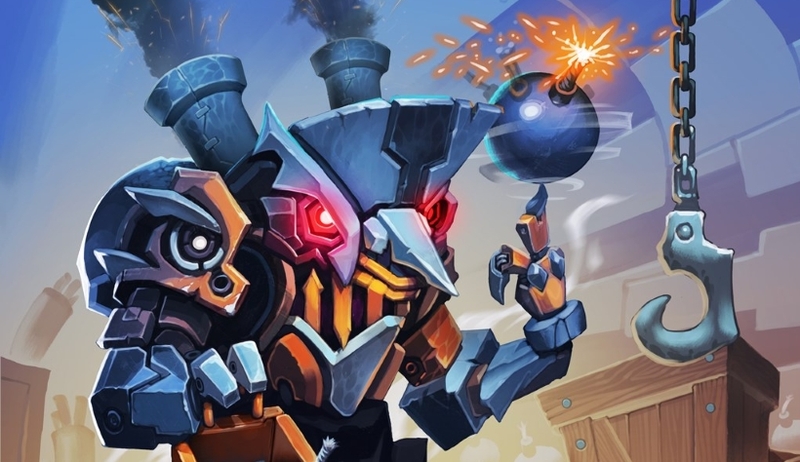 - The damage spat out randomly by Dyn-o-matic will not harm Mech class minions, so don't worry about your own side of the board in this context. - New weapon Supercollider will force the target you use it on to attack an adjacent enemy minion. If you can line this up in such a way that they destroy each other in the process, that's the dream scenario. - If you can work the board in order to increase the odds of getting a good result from Brawl, do so! - Zilliax is a Magnetic minion, which means you can combine it with another Mech by placing it to the left of the target. The stats and effects of both Mechs are then combined into one entity. If you want the minions to remain isolated from each other, drop it to the right of the target. - At the end of your turn, Ysera will add a Dream card to your hand for free. These can be incredibly strong minions or spells that can be extremely useful depending on the current state of the game. Omega Assembly: You always want to save this for the ten Mana bonus as it’ll give you a huge amount of extra value in the late game. Shield Slam: The upgrade to Tank Up! means you’ll be generating more Armor compared to your standard Hero Power, making this removal even more effective. Reckless Flurry: Again, with all that extra Armor generation you can execute some substantial board clears with this card. Smolderthorn Lancer: Works as the deck’s version of Execute. You’ll need to be holding a Dragon in hand for the ability to trigger, but that shouldn’t be an issue with the number you run in Odd Warrior. Brawl: Perfect for thinning out the board if you’re getting rushed down. Play a cheap minion on your side along with it and see if luck is with you. Emberscale Drake: Remember Shieldmaiden? Here she is again but in a new Dragon form. An excellent card for the cost that’ll generate you some Armor, while also putting a decent body on the board. Supercollider: A unique weapon that allows you to exploit the positioning of opposing minions to force them to deal damage to themselves. You can consider adding a Gorehowl here if you don’t have two copies in your collection. Zilliax: A strong control card that can also be paired with many of the Mech minions in this deck for an even bigger impact. Crowd Roaster: Hugely impactful Battlecry effect that should be able to kill most minions with ease. Dr. Boom, Mad Genius: The Doc returns in a new form, one that offers some insane late game value and exciting mech synergy. Baku the Mooneater: You don’t really want to play this as a minion unless you have to - it’s mainly in the deck for the improved Hero Power at the start of the game. Ysera: Adds even more late game potential to the deck with all the Dream cards she adds to your hand, giving you more minions or powerful spells that can finish off the game.